Step 1: Specify the field manager interviewers. Finally, make sure both the interviewer users and the field manager user are assigned to the relevant survey. 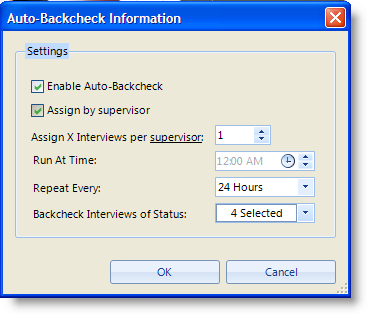 By Supervisor: Means that out of the pool of the interviews performed by the interviewers assigned to the field manager, X random interviews will be randomly selected and assigned to the field manager but in no case no more than X interviews. By Surveyor: Means that out of the pool of the interviews performed by the interviewers assigned to the field manager up to X random interviews of each interviewer will be assigned to the field manager but in no case no more than X interviews * interviewers. Run-at time Cut off time for the day. Recommended to leave at 12:00am as the default. Repeat every Interval of when to run the assignments, recommended to leave at every 24 hours.